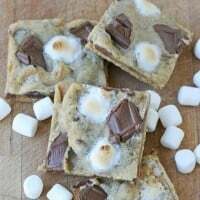 If you love all the flavors of s’mores but are short on time, this is a quick and easy treat to satisfy your craving. I thought I was quite clever when I thought of this idea last summer… but apparently lots of other people thought of it long before that! The earliest post I can find is from the delicious blog Gimme Some Oven. Add sticks to the marshmallows, by holding a marshmallow on the counter (or cutting board) and pressing the stick down into the marshmallow. Then, melt the chocolate in a large mug or glass measuring cup, in the microwave at 50% power, in 30 second intervals, stirring between intervals. 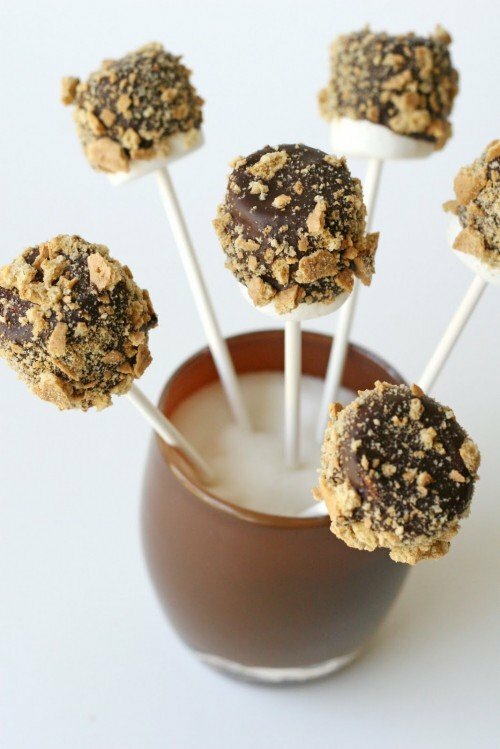 Dip marshmallows (on sticks) into the chocolate, allow excess to drip off, then hold over a bowl and sprinkle with crushed graham crackers. Place sticks in a mug or container so then can dry upright. In warm weather, place pops (in mug) in the refrigerator or freezer for 5-10 minutes for the chocolate to set. Once chocolate has set, store pops in an airtight container (in a cool location) for up to 3 days. Prop note- I photographed my s’mores pops in some of my beautiful glassybaby glass vessels (usually used as candle holders). The colors are burnt sugar, caramel, and dune. Great kid idea, love it! Great idea! I will have to use it for my next party. These look great and love the glasses they're in. So yesterday I told you about the annual smores contest we have at our fire-pitless camp site… This is what one of the other moms brought this year :o) The kids LOVED them!!! 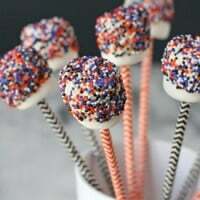 These look so fun and easy to make! My friends (my adult friends who are really giant kids) will inhale them! Hehe, love it! 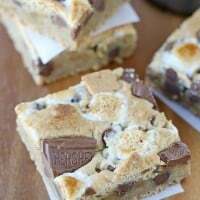 I'm on such a smores kick right now! I love these! What a FUN treat, Glory! this is brilliant – i bought marshmallows yesterday to make some rice krispie bars but the kids stole the mallows and ATE THE WHOLE PACKET !! I discovered them in their playroom with a basket filled with red lego "that's the fire" they said and were holding coloring pencils over their "fire" with marshmallows stuffed on the end…is that a hint we need to go camping? 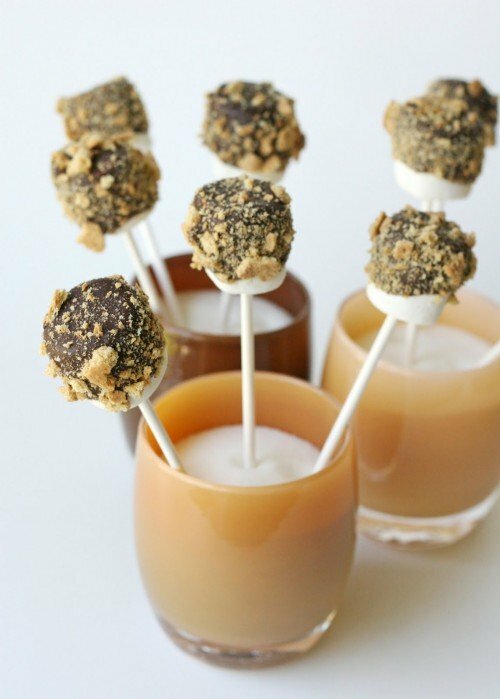 Have to get some more marshmallows and will make these for them… so cute! I made them without sticks, but everything is better in pop form. why the need to store them for 3 days? is that when they go bad and you shouldn't eat them anymore? Wonderful, thank you! Just finished making them for my daughter's party. She was able to do the dipping herself and loved it and then declared the finished product delishious. I'm going to give them as party favors: got small paper party cups in theme of choice, fill halfway w plain m&ms;, and stick in marshmallow pop. For now, the are all in freezer split between two very large, wide cups filled w m&ms. ; Fantastic blog- you are so talented!!! Wonderful, thank you! Just finished making them for my daughter's party. She was able to do the dipping herself and loved it and then declared the finished product delicious. I'm going to give them as party favors: got small paper party cups in theme of choice, fill halfway w plain m&ms;, and stick in marshmallow pop. For now, the are all in freezer split between two very large, wide cups filled w m&ms. ; Fantastic blog- you are so talented!!! Clever…I never thought of putting them on sticks :). 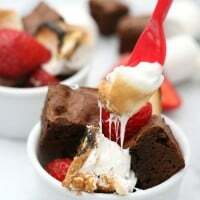 I make home made marshmallows and cut them in to about 2in by 3 in , dip in chocolate and cover with graham crackers. My Co-workers love them and are always asking me to make them. I think I will try your idea of making them smaller and putting them on a stick too!! You have such great Ideas. 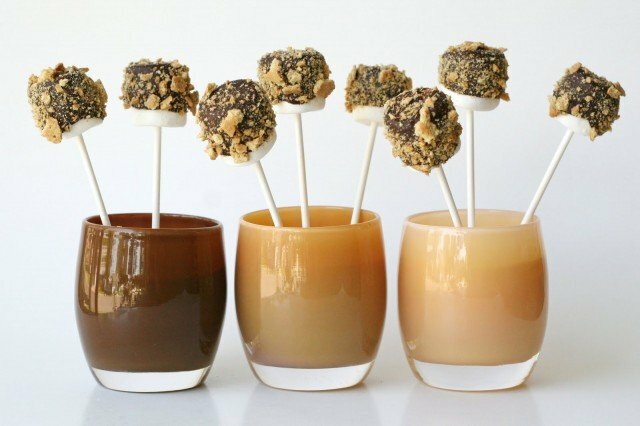 Love the use of your glassybabys for these treats!